These French Doors come with a galvanised steel reinforced inner frame, providing solid fixings for all the lock components. Multihook points fitted to the master door lock into the slave leaf, reinforced with aluminium for extra strength and rigidity. The glass is toughened and double glazed as standard. UV Stabilised with titanium dark side, which is the whitest substance known to man and protects the doors from going yellow. Comes complete with a lever/lever handle configuration, available in Chrome or Gold. Other handle options are available, please look in the 'Accessories' tab. Depending on the size of your French Door you may require a sidelight or sidelights. If you do require one of the two then you still pay the same price that you see in the 'Product Pricing' Tab. 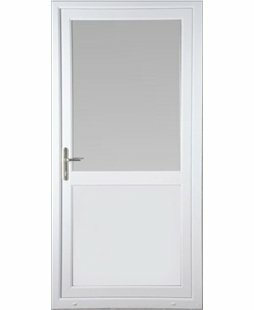 Please note: all of our uPVC French Doors come white on the inside as standard. 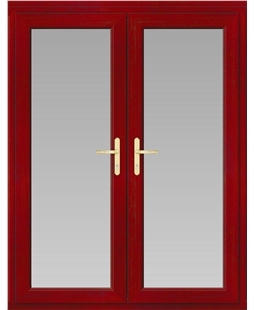 You can opt for your uPVC French Door to be coloured on the inside if you wish at an additional cost. Here at Value Doors UK, we have our own specialist and internally trained door installers to ensure our customers receive the excellent service they deserve and expect. These door installers are the only people who will visit your home, meaning you are free from any strong arm sales tactics and able to make an informed decision in your own time. Ordering your door could not be simpler. 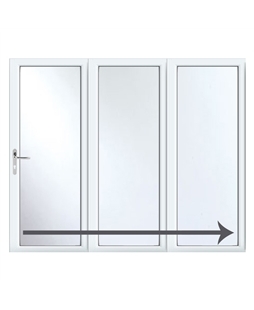 Choose the door you like - spend some time looking through the wide selection of designs we have to offer and make notes of the doors you like, using the 'Wishlist' button next to each product. This will remember all the designs that interest you and can be accessed at any point through the 'Wishlist' tab, located near the top left-hand corner of your screen and next to the 'Home' tab. Survey - one of our installers will visit you, answer any questions and discuss any special requirements you may have. They will measure your door and advise you how they will take your old door out, how the new door will be fitted and how they will finish off inside. They will then confirm the total price, as shown on this website. The entire visit usually takes under half an hour. When you are happy with all aspects - you can confirm your order and arrange the installation date. You can even do this on the spot as the installer who visits you will be fitting your door. Installation - we will then install your door (usually between 10 -14 days after the initial visit) and only when you are completely satisfied with the job will we ask for payment. It really is that straight forward. When we have installed your door, we will clean up after the work, make good (the vast majority of installations require no redecoration afterwards) and when we leave, we'll take your old door and frame and dispose of it, at no extra cost to you. Alarm Information: Ideally alarm contacts should be removed and refitted by your alarm engineer, but in most cases, this additional expense can be spared by our installer doing this work for you without charge. We, however, are not alarm engineers and therefore can take no responsibility for any costs that arise if the alarm cannot be refitted and will not, for instance, reset if it is accidentally triggered. We undertake this service as a gesture of good will without charge and therefore cannot accept any costs if things don’t work out and an alarm engineer is required to rectify a problem however caused. Please Note: They may be an additional charge for installations in the Scottish Highlands and Islands. Other optional extras may be available, please speak with our enquiries team or your local installer directly; they'll be happy to discuss your requirements. Value Doors UK has teamed up with 'Lostakey' to provide our customers with a free key return service. Every door we sell comes complete with a key ring just like this. Each one has a unique 7 digit code etched onto it. This is your membership number. If you suffer the misfortune of losing your keys, the finder will follow the simple contact instructions on the reverse. Once they have contacted Lostakey (either through their website or the freephone number), Lostakey will get in touch with you and pass on the finder's details; enabling you to arrange the return of your keys. The finder will receive a reward - at no extra cost to you - and will never be given ANY of your details, ensuring your personal security and safety. To take advantage of this excellent service, just revisit our website to register your installation (click here for information) and while doing so, include your unique key ring number in the space provided. We will take care of the rest. The first twelve months coverage is free of charge, if you wish to continue using the service then renewing your subscription is just £5 for the following year. There is NO obligation to continue beyond the initial twelve months however, and if you do not want to take advantage of this offer, just leave that part blank on the installation registration form. If you would like further key rings and protection for additional keys for just £5 each, just mention this to your local installer during the survey, alternatively call our team on 0800 955 0898 and we'll be happy to help. 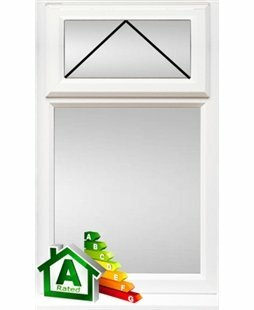 A 10 year Insurance Backed Triple Guarantee is included with every installation by Value Doors UK - Absolutely Free! That’s three times the protection for your new door or window, meaning three times the peace of mind for you with your home, ALREADY INCLUDED IN THE PRICE! NO OTHER DOOR COMPANY IN THE COUNTRY OFFERS YOU THIS MUCH PROTECTION! INSTALLER - In the first instance, the installer who fitted your door will be your first port of call in the unlikely event of any issues arising from your door installation. MANUFACTURER – If the installer is unable to honour the guarantee, Value Doors UK will step in and rectify any issues covered under the guarantee. INSURANCE COMPANY – We want our customers protected against any eventuality, which is why our guarantee is insurance backed by the guarantee specialists QANW, all at no extra cost to you. As corporate members of the Guild of Master Craftsmen, CERTASS and FENSA, our free and insurance backed, ten year triple guarantee –along with our code of conduct and method of operation – has been vetted by several leading organisations within the exterior window and door installation sector, so you know that this is one guarantee worth the paper it’s written on. To register your guarantee, all we ask is you register your installation within 21 days from the point of fitting, leaving you to enjoy the peace of mind our guarantee provides. Free Insurance Backed Ten Year Triple Guarantee with every installation? That’s Value! Full written details are available on request. Full Terms and Conditions apply. At Value Doors UK we are committed to offering the best customer service in our industry, that's why our phone lines are always answered by real people, 24 hours a day, 7 days a week, including bank holidays. Depending on the size of your French Door you may require a sidelight or sidelights. If you do require one of the two then you still pay the same price that you see below. CE Marking is the new European standard for windows and doors. It is similar to British Standard. It is a legal requirement as from 1st July 2013 that all windows and doors are CE marked. All products from Value Doors UK meet or exceed the CE Marking requirements. All our doors and products are fully compliant with all UK and European standards and legislation. In the rare instance your door requires any certification; we will do this for you automatically, free of charge. Our installers are fully up to date with current Building Regulations and will know if you require any certificates. These will be sent out to you approximately six weeks after installation. If you have any questions, feel free to contact us or ask your installer direct.